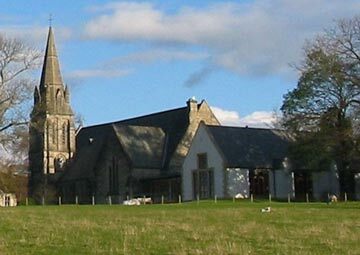 There are references to a church in Killearn as far back as the 13th century. Some of the buildings are still visible today. In the old cemetery is a ruin of one such building. It was rebuilt in 1734. Scotland experienced revival in 1839. In 1843 the Church of Scotland was split by "The Disruption". The present building built in the Early English style with its 100ft spire opened in 1882. This is the current Kirk Hall attached to the Kirk. It was built in 2001 after the previous halls were condemned. It was funded by direct giving, sale of the old hall and some grants. The halls are made up of a foyer, kitchen, toilets and 3 halls which can be set up as one big hall or 2 halls or 3 separate rooms with partitions that are movable which lends itself to any number of events. The kitchen is equipped for most requirements. 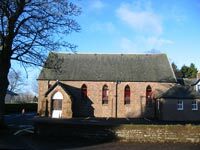 It is well used by the church and its organisations as well as local youth organsations, yoga, tai chi and embroiders guild. It has proved a popular venue for parties and other events. 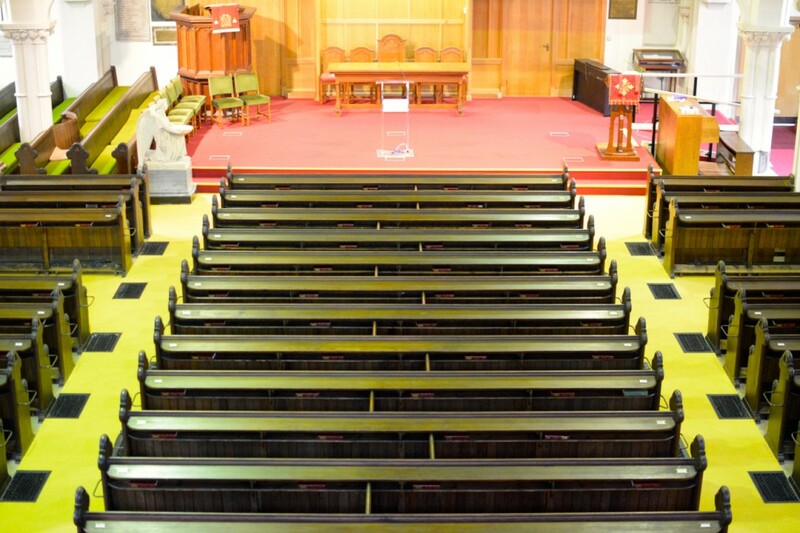 After the Union nationally in 1929, the local Free Church united with the parish in 1931; the building became the church hall. 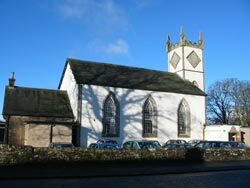 The previous hall (the Village Hall - white building) was sold to what is now Stirling Council and is managed by a local committee with some help from Killearn Trust. The former Free Church, emptied of pews, was given a ceiling with no inspection hatch; woodworm over the fifty years had a feast resulting in the trusses failing in 1996. Activities were moved to the extension which had been built in 1971. The Session House was built in 1967, gifted by an anonymous donor. The windows by the well-known Scottish stained glass artist, Sadie McLellan (1914 - 2007) were donated by Killearn Trust in 1969. Uriel (red and orange wings) is represents the love of God. The sword and balances in the left window refer to Michael, representing Supreme Power. In the right window Gabriel brought God's Word to Mary (the lily) whose Son, Jesus, would be the king whose kingdom (the sceptre) would never end. Luke 21:33. Gabriel shows the Sovereignty of God. Raphael is shown by a fish (blue), a water bottle and a pilgrim's staff (amber) and represents the Church. The church (fish) consists of people who believe in Jesus Christ, God's Son, Saviour, (Greek, Ichthus = fish), travelling life's path together (the staff) inspired by the water of life (Christ's Spirit in them. John 4:14).